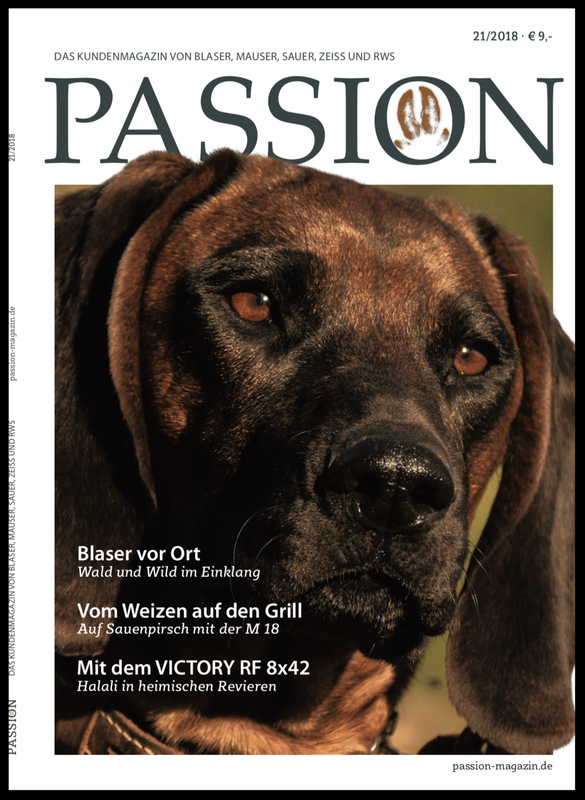 PASSION is the exclusive customer magazine for the German firms of Blaser, Mauser, SAUER, ZEISS and RWS. PASSION is the exclusive customer magazine for the German firms of Blaser, Mauser, SAUER, ZEISS and RWS. PASSION uses a premium glossy format to inform the customer about each of the five sponsors’ newest products and trends. Appearing annually in English, this is your source of first-hand information – the editors of PASSION have opened the otherwise locked doors to their design, manufacturing and assembly departments. In PASSION, professional hunters, scenthound handlers and African guides get their say. In addition to introducing the reader to the most current hunting practices along with plenty of industry tips and know-how, we also showcase some of the most enchanting hunting spots from around the globe. Every issue features the latest outfits for the fashion-conscious outdoorsman. Reports, interviews, photo spreads and insider knowledge guarantee infotainment of the highest level, all presented in a modern and elegant format.